Update: This project was featured on WBUR's (90.0, Boston NPR Station) "Here and Now" program on February 18th. Once again I had a project planned and ready to go...spent a few minutes on twitter a couple of nights ago, scrapped the plan and decided to roll out an entirely new project. My students have come to accept and expect this of me at this point. My 9th grade World History students have been studying the French Revolution & the Egyptian Protests. (I wrote earlier about the resources we used in class as well as a Egypt infographic writing assignment we did last week.) The project was originally just going to be about the French Revolution. However, when the events in Egypt started to unfold, I couldn't pass up the opportunity to have my students learn about a revolution as it happened. The goal was to see them make connections, discover differences and hopefully recognize a pattern that tends to occur within revolutions. Then, I came across a few messages on twitter from @neilringrose about 'Choose Your Own Adventure' style videos that could be made with youtube. The concept seemed straight forward enough. Plan out a series of videos that can be linked together within youtube (using their notation 'spotlight' feature). This process gives the viewer the opportunity to decide what information they will view next. The Knewton Edtech Blog has a great walk through and example on how to make these videos. To apply this technique to my history class, I had students create videos that compared the French Revolution & Egyptian protests. The videos were extremely structured and every group was given the same graphic organizer to manage the work flow. In the future I may choose to have the groups come up with their own organizer and work flow, but for the first time through I wanted to keep things manageable. Here is the organizer that I handed out to each group. Each box in the organizer represents a separate video that is uploaded to youtube individually. With each individual upload, the videos can then be linked together to allow the viewer to decide their path. 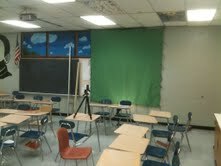 I also decided to borrow a few green screens for the project. When a group is discussing the early stages of the French Revolution, they may have a picture of Louis XVI edited in. When discussing the early stages of Egypt, Tahrir square. Besides making the videos a bit more interesting, I was able to teach my students how to appropriately name files in order for them to be shared with other people. Just this requirement alone, having specific file naming structure and conventions is beneficial for students to learn and understand. I had never used green screens before. The one tip I would give is to make sure there is a light between the person being filmed and the screen to avoid any shadows appearing on the green screen. To have a selected image appear on the green screen you just have to drag the desired image into a new iMovie project, and then drag the footage over the image. The advanced settings have to be turned on first to make sure the green screen option appears. Another tip, make the length of the image the same as the video clip. Here is a tutorial on youtube about using the green screen feature in iMovie. What was absolutely amazing about the project was how seriously the students took the filming process. 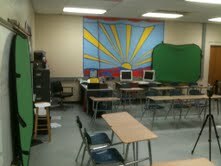 I had three green screen setups in my classroom and another in our graphics department that one group used. 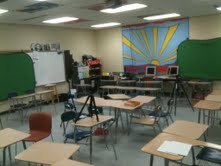 Within my classroom, without instruction the groups would rotate turns filming and would wait in complete silence while another group had the camera running. If a group need to discuss their next shot, they would walk out into the hall and prepare without disturbing the other groups. If none of the groups was shooting, it was absolutely organized chaos, but good organized chaos. Within four days, all six groups finished filming, and I should have the videos posted in a day or two. Note: Choosing a path works best when viewing the project directly within youtube. Great project--the kids above look like they are having a blast. I loved the competitive banter (aka advice) over whose path to choose on the videos. Very engaging to watch. Did you find that your students were successful overall in drawing connections, discovering differences and recognizing patterns that tend to occur within revolutions? Thanks for reading & the comment. What I have found is that my students are talking about Egypt a lot. They argue if it is going to become radical like the French Revolution did, and they want to know day by day what is going on. They are watching the news and debating whether Louis XVI or Mubarak could have avoided the turmoil in their respective country. One other thing that I've heard teachers talk about in your situation is getting a couple of kids to volunteer to do all of the uploading. If you have a couple of tech nerds who are either really good doobies or in need of a boost to their grade, it's possible to use them to do all the tech stuff. But, of course, this is an awesome project! Found this post after coming to look at the Hamlet graphic novel; WOW, this is such an awesome project!! Great job!